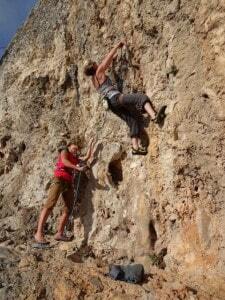 This new 2 day Rock Skills Learn to Lead Sport course is for climbers who are ready to lead bolted sport climbs. The Sport Lead Course is designed to enable climbers to lead sport routes both indoors and outdoors. 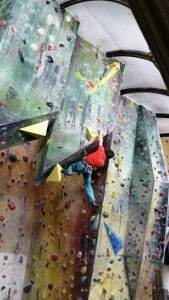 Climbers who want to learn to sport lead climb must have climbed regularly and have an understanding of what is meant by good climbing technique. If, when and how to spot the lead climber before he has secured the first clip. How much rope to pay out. Lead belaying techniques to reduce the risk of a leader ground fall. The correct lead belaying position to be able to see the climber and when to pay out or take in. To clip efficiently, as well as what Z-clipping and back clipping mean to the climber. To clip left and right handed. To clip using a straight arm. To develop good body position when clipping as well as resting. How to avoid common mistakes. The hazards of lead climbing. How to belay a fall. How to thread the belay at the cliff top to retrieve the rope. Venue: Wyndcliff Quarry & Wintours Leap – Woodford Quarry Cost: £150. Minimum of 2 people and includes any equipment needed. See Calendar for dates available. One day refresher courses are available on request – £140 for a 1:1 £95 each for 2 or more people. You may wish to book a bespoke course – minimum of 2 people, maximum of 4 – if these dates aren’t suitable. Contact Ali on 07814555378 or by completing the form below. This one day course at The Warehouse, Gloucester or Undercover Rock in Bristol, is suitable for those who want to take the next step indoors and begin lead climbing. You must have climbed regularly and have developed good technique, with good balance and precise footwork. You must have a good understanding of the dangers inherent in lead climbing and the importance of safe and attentive belaying. How to spot the lead climber before he has made the first clip. Lead belaying techniques to reduce the risk of a leader ground fall, staying in close to the wall. The correct lead belaying position on the safest side of the climber to be able to see the climber and when to pay out or take in. To clip off a straight arm. How to use a clip stick to prevent a ground fall. Rope management – flaking rather than dragging the rope. How to clip the belay at the top to safeguard a top roper. Courses run with a minimum of 2 people maximum of 4. Price £85 including entry and any equipment needed including lead ropes. Although this course teaches you how to belay and clip it does not prepare you for outdoor climbing where bolts are often further apart, rock is harder to read and hazards are more dangerous – loose rock, ledges, overhangs etc. Courses can run at an appropriate climbing centre of your choice if you are booking 2 places or more i.e. with leading walls of at lest 11 m in height, with bolts and karabiners in place and chain belays with 2 opposing or screw gate karabiners.